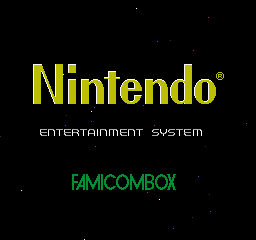 The FamicomBox is a display unit console primarily used in Japan. It can have multiple games loaded in, plus an optional coin box and a timer. Strangely, while it uses Japanese games, everything is NES-themed! Turn the key on the FamicomBox front panel all the way to the left. When the "GAME TITLE & COUNT DISP." screen is displayed, press Up, Down, Left, Right, A, B, Select, Start on Controller 1. 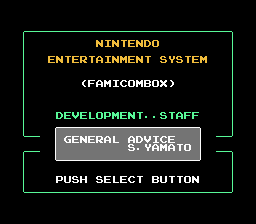 The screen will scroll up, and instead of the menu a screen reading "NINTENDO ENTERTAINMENT SYSTEM (FAMICOMBOX) DEVELOPMENT..STAFF" will appear. Now, press Select to cycle through the staff members. THIS PROGRAM IS MADE BY TOSHIO SENGOKU. MAKE START 1986/08/27 - MAKE END 1986/09/10. This page was last modified on 24 August 2017, at 23:09.